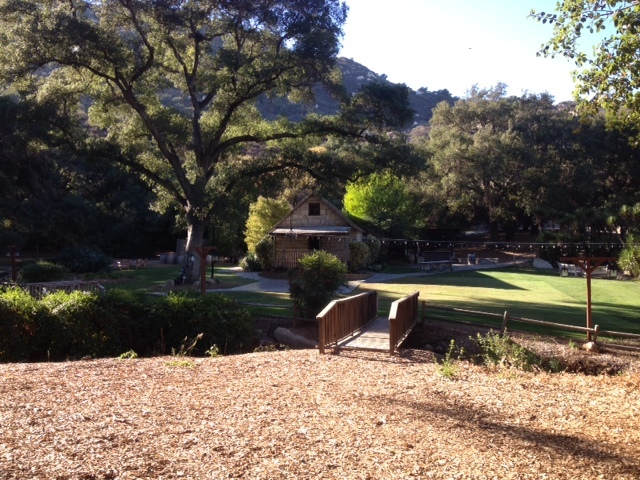 The first time I played the Stonehouse nine at Temecula Creek Inn last year, I remember arriving at the first tee and feeling like I’d been transported to another state. The mountains. The pine trees. The elevation changes. It immediately evoked feelings of trips I’d taken to Boulder, Colo.
And that’s how I describe Stonehouse. It’s like a little manicured piece of Colorado landed in California. If you’ve not been to Temecula Creek Inn (TCI), it’s the 27-hole resort course you see while traveling the 15 south of the first Temecula exit. It’s actually Stonehouse you see from the Interstate. The landscaped “TCI” is the No. 3 fairway. If you’ve played TCI and haven’t played Stonehouse, well, you’ve missed out. The other two nines – Creek and Oaks – are essentially the same nine. Stonehouse is a drastically different experience and for me is a treat to play for a number of reasons. Once you learn to negotiate the two blind tee shots here, Stonehouse should be a scoreable nine for you, no matter your skill level. It’s more aesthetics than challenge that draws me to Stonehouse, though it does have by far the toughest hole on the course – the downhill par-4 6th, which we’ll delve into later in this post. As much as anything, I just like the feel of Stonehouse, probably because it speaks to my Midwestern soul, even when it’s 82 degrees in November as it was on Thursday. Also, the more I play Stonehouse, the more I appreciate how over nine holes it embodies the sound design principals of what you want in a great 18. It’s eases you in with an easy (if you know where you’re going) par-5 and short par-4 (I watched someone with a very limited tee game par both) and then gradually gets tougher while also revealing increasingly interesting holes in a pleasing evolution. Before fast-forwarding to No. 6 to highlight the home stretch of Stonehouse, I’ll simply offer this shot advice on the preceding holes, though you have to play them to understand. The tee shot on No. 1 is bewildering to first-timers. I’ll just say swing away and don’t sweat it. You don’t need to be perfect and can recover here, even if you find the bunkers on the right off the tee, as I did Thursday. On the blind, short par-4 No. 4 – there’s a complex of bunkers you don’t see on the left that you can’t possible account for without having played it. The first time, lay up to 220 yards or so and then try to bite off the whole 331, which can be done, next time. If there won’t be a next time, favor the right side, and good luck. On the dead uphill 180-yard par-3 5th – the locals say it plays two clubs up. I don’t disagree, though it’s a bear to chip back if you go long. There’s nothing wrong with being a little short here and taking an easy par. Now a hole-by-hole of the final four. No. 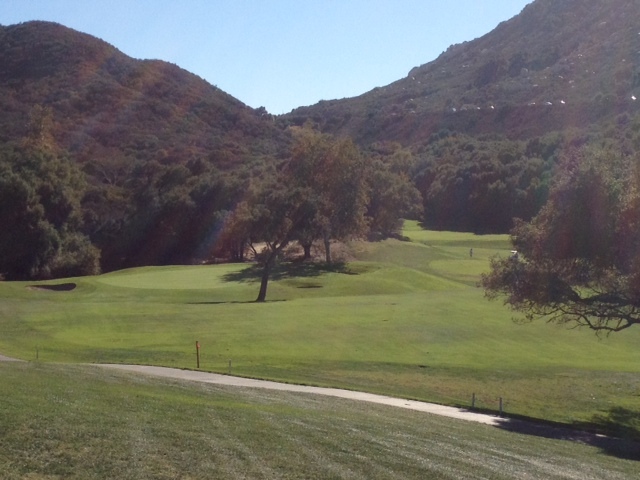 6, par-4, 416 yards (blues), 396 (whites) – Take in the view, because you won’t find many like it, save for at Journey at Pechanga just down the road (which you can actually see from the No. 5 tee and green and probably the No. 6 tee as well). Like a Colorado ski slope, No. 6 is dead downhill but played to a mountainous backdrop with traffic on the 15 streaming by (noiselessly, I might add). The fairway is actually quite wide, but the complicating factors here are wind, dead into you, and slope. The fairway slopes right, so favor the left side off the tee. It’s a tough shot, one of I’ve mostly failed at it. But if you catch one here, savor it, because it’ll look postcard pretty, soaring above the mountain peak before nestling in the fairway. The second shot is again downhill to an undulating green placed amongst dense woods. Even with the wind, club down here as second shots are prone to going long and you’re playing for par anyway. It’s a tough hole, the No. 1 handicap. Especially stay out of the right woods, which is a hunting expedition for your ball followed by a beastly recovery. Make par here and I’ll like your odds of walking off Stonehouse with a nice number. No. 7, par-4, 351, 333 – A subtle dogleg right that seems to play downwind, but, given the yardage, hardly requires a monster tee shot. Lay up to the turn and it should be an easy par. I, however, hit a draw 290 over the trees on the right with a 3-wood and made an easy bird, so obviously I’ve favorable to that approach. My ball settled in next to the third green and made for easy access to the seventh green. On the green of this secluded hole, you see get an unexpected surprise by discovering the course’s quaint event area centered a little cottage. Part of me wishes this was a brewpub and you could stop for just one and savor the experience. The first time I encountered it, the area was lit by lights and truly gave off a special aura. But alas, pace of play demands you press on. No. 8, par-3, 165, 153 – Like the cottage, quaint could also describe this hole, a rather harmless par-3 that’s a prime birdie opportunity with a well-placed tee shot. Just don’t miss right into the woods and there’s little to trip you up here. No. 9, par-5, 555, 540 – Negotiating a tight tee shot is the biggest obstacle here, but it’s a three-shotter (though I did reach in two with a rescue once), so mostly hit what you’re most confident with and stay in play. The green is essentially an inland, fronted by ponds and a waterfall with landscape accents. It’s a fabulous finish, especially if your approach finds the green and you walk off with a four or a five on your card. The tiered green is smallish, also making reaching in two tricky, and is best approached from an angle as far down the fairway as possible. If you’re still 200 out, hit and pray. If you’re much closer, just know you can’t go over or there’s cart path and OB. 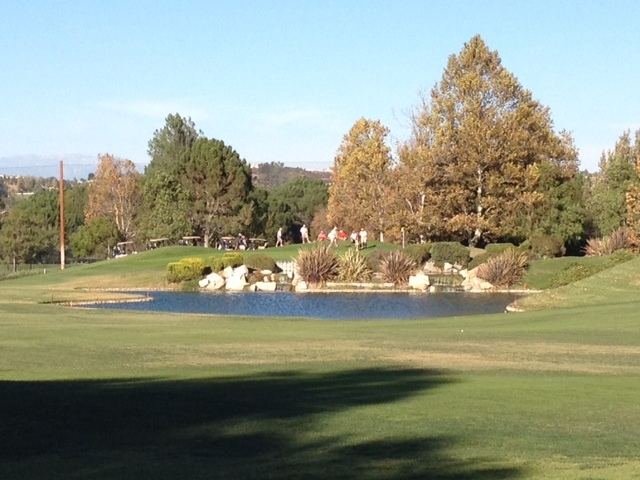 When I played it on Thursday, Stonehouse was in the best shape I’ve seen it and draped in fall accents. It evoked feelings of fall in the Midwest, except better because it was mid-November and I was golfing. If you make it to TCI, make sure to include Stonehouse in your loop and enjoy a golf experience you don’t find in California every day. 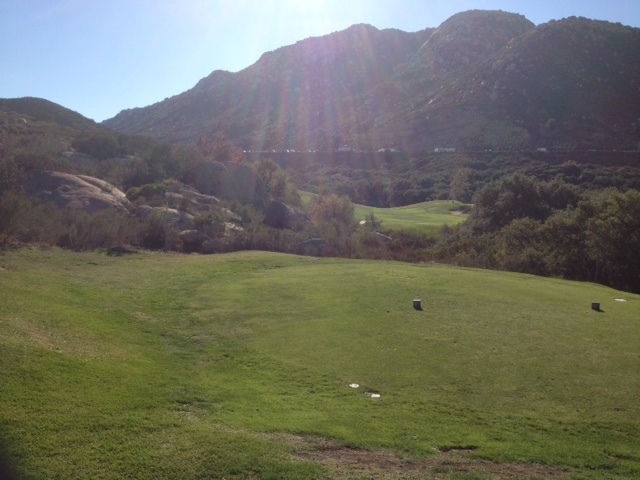 This entry was tagged Colorado, Golf, TCI, Temecula. Bookmark the permalink.